Using a simple bread dough or bread dough purchased from your local baker: Roll the dough into evenly sized balls, about the size of a golf ball. Add the oil to a thick-based pan and fill it with the round dough balls until it completely fills the bottom of the pan. Place in a warm area to rise for about 35 minutes or until doubled in size. Place the pan with the dough balls over a low heat with the lid on and begin cooking the bread. After about 15 minutes the bread should have a bit of a crust on the bottom. Carefully turn over and cook the other side the same way. Once both sides are perfectly crisp and the inside cooked, remove the bread from the pan and allow to cool until it can be handled. For the BBQ glazed angelfish: heat the oil over a medium heat. Add the fish skin side down and cook for about 2 minutes before cooking the other side for another 2 minutes or until almost completely cooked. Combine the BBQ marinade, apple cider vinegar, Tabasco and chilli flakes before adding to the pan with the fish to reduce slightly and glaze the fish. Remove and set aside. Combine the sour cream dip and lime juice for the dressing. 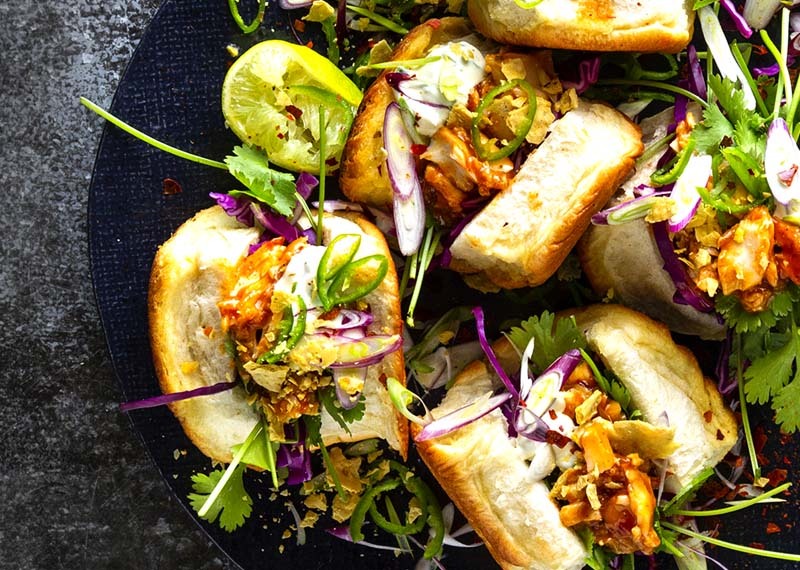 Cut the fried buns open and fill with the cabbage, coriander and sweet, sticky fish. Add the red salad onions, and green chilli before finishing off with a drizzle of the sour cream dressing and the crushed nacho chips for a little extra crunch.